UNITED NATIONS (AP) — A gaping ideological divide cuts through this year’s gathering of world leaders at the United Nations. It’s not between capitalists and communists, rich and poor, East and West. It’s between multilateralists who advocate nations working together and unilateralists who are pushing for national sovereignty. Despite near-universal hand-wringing about the U.N.’s failings, it was clear who was in the minority on Tuesday. President Donald Trump stood alone in his unashamed defense of the “America First” agenda that helped propel him to power — an isolationist worldview that questions the worth of international organizations and is embraced by a small but growing number of populist governments. Trump was surrounded by multilateralists, many of them traditional U.S. allies, who want more cooperation, not less, to tackle global ills such as climate change, poverty and mass migration. Guterres, who heads the 193-member U.N., warned of the dangers of nations turning inward in a speech that was the inverse of Trump’s. “In the face of massive, existential threats to people and planet … there is no way forward but collective, common-sense action for the common good,” he said. He warned of “a pivotal moment” in global warming that risks runaway climate change if leaders don’t act in the next two years. He urged nations to implement the Paris climate agreement that the U.S. is withdrawing from. 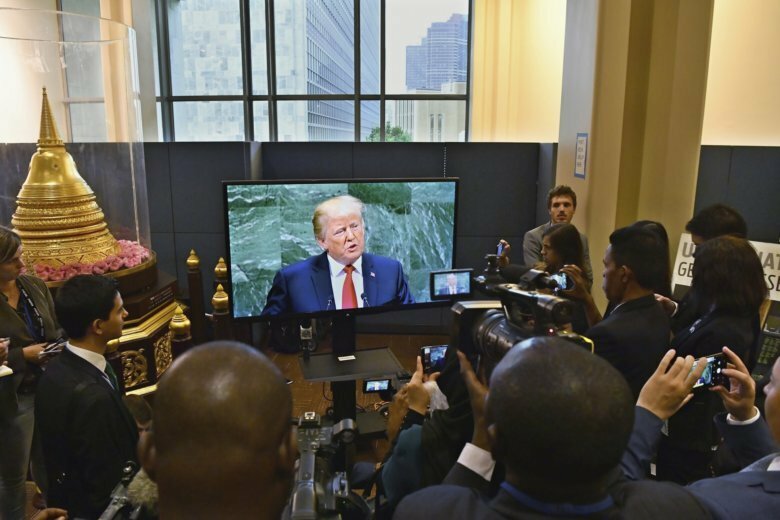 Although it was Trump’s chance to speak to the world, he appeared to play to a domestic audience and struck a triumphalist tone. He lambasted the U.N. Human Rights Council and the International Criminal Court, and rejected a global pact on the rights of migrants. Temer urged world leaders to recommit to international cooperation. He said that his administration has done its part by opening Brazil’s economy and by welcoming Venezuelans fleeing their country’s economic collapse. He urged reforms of the U.N. Security Council, which is dominated by five permanent members — the U.S., China, France, Britain and Russia. Kagame said the trend in Africa is for more cooperation, not less. He cited the signing his year of the African Continental Free Trade Area, and increased support for African Union peacekeeping operations. He said multilateralism is critical for the planet’s future but requires more fairness. “A few get to be the ones to define the norms, by which others shall be judged,” he said. Erdogan highlighted Turkey’s aid to 4 million Syrian refugees — a contrast to Trump’s defense of securing U.S. borders from undocumented migrants. He declared the U.N. to be “very important for the future of the world” but with a caveat: Security Council reform. Erdogan struck a nationalist note too — warning “friendly countries” that fail to extradite terrorists wanted by Turkey would carry a “hefty price.” The increasingly authoritarian leader referred to a U.S.-based Islamic cleric whom he blames for a failed 2016 coup attempt. Macron noted there has been increasing skepticism toward the U.N., European Union and other international bodies. He said that “you may be tired of multilateralism,” but urged against complacency and isolationism. Faure defended the U.N. and said the existence of his Indian Ocean island nation depends on states upholding global commitments to fight climate change. Rouhani’s speech was dominated by Iran’s bitter rivalry with the U.S. which under Trump has withdrawn from a 2015 nuclear agreement with world powers that provided sanctions relief to Tehran. The U.S. accuses Iran with supporting terrorists. Associated Press writers Jennifer Peltz, Edith M. Lederer, Angela Charlton and Cara Anna contributed.